I might be interested for some shooting tomorrow... but it must be warm and indoors. The trip to the zoo made me sick ... and either in North York-ish or easy access by subway. Wasn't all that packed in the early afternoon, late afternoon (4PM) it was packed. Car's are not really my thing. However, Ontario Science Center sounds fun. I'd like to visit that again sometime this year. I'm checking the map for Centennial Park, and that's not too far of a drive for me. I might do that tomorrow! I usually shoot alone before and after work, and past midnight. I haven't got into any trouble yet. Am I the only weirdo that talks to myself when I am alone taking photographs? Just kidding... I definitely do sometimes as well, but I also do in many other situations, like cleaning. 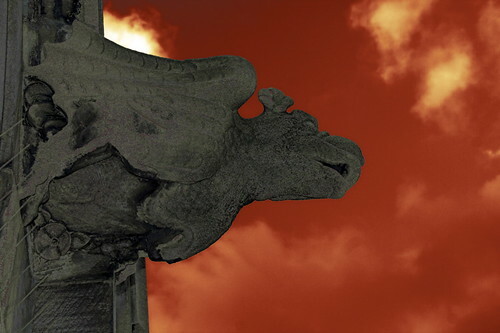 Has anyone taken pictures of gargoyles in the city , there are some nice ones at Richmond & Yonge. I have a rolling case for my gear (easier to pull than lug on my back) and want to just meander around, shoot, walk, enjoy the day, stop for a beer/glass of wine, etc. This would be a good April project as the skies are very blue for gargoyle side profiles. There's also Greenwood Conservation Area (Ajax), the Port of Whitby, the bluffs between Whitby and Oshawa (always interesting stuff washing up on the beach - remember to look down! ), the nature reserve behind the General Motors head office in Oshawa, Seven Mile Island on Lake Scugog in Port Perry, the quaint/rustic downtown Port Perry itself, and then there's the Pickering "Nuclear" park with the massive $2 million windmill. Hope these galleries spur some thought to heading east! Enjoy. With Spring time upon us, are there specific places to go to take advantage of the start of a new season? the nature area at the GM Headquarters is call "Oshawa's Second Marsh". Frenchman's Bay in Ajax. There's the east side down Liverpool, or the west side down West Shore Blvd. Rouge Beach, which is the east end of Lawrence Ave E.
Glen Rouge Park, off Twyn Rivers drive and off Meadowvale directly east of the Zoo. East Point Park, near the mouth of Highland Creek in South Scarborough. Rosetta Park, Scarborough - Birchmount and Kingston Rd. I am adding the Guild Inn Park to this list -- excellent. Located out in Scarberia! South of Kingston Road on Guildwood. ooo I definitely agree with the Guild Inn suggestion. Yes, it's out in the middle of Scarlem but it's definitely worth the trek. There's the crusty inn and a park full of random buildings, monuments, sculptures - all with historic significance (they were part of an old bank, school, etc). It's kinda bizarre but fun. You could spend all day there! And I think there's a path down into the Bluffs as well. I need to go back. I hardly ever venture into Scarlem. I didn't even know that this place exists! We should make that into a photo excursion. What's funny is that the Guild Inn was mentioned twice already way back in Nov by Dave Mac & Ian. It's a great place to shoot as mentioned, but forget about the weekends. One saturday afternoon, I counted 6 wedding parties there for pictures. If you go on a weekend you have to go super early or super late. The only time i went out was on a Saturday morning, and the weddings were starting to roll in as i was leaving. Count me in for the Guild. Like how I just invited myself? Do you guys prefer the weekend or during the week after work? Hey guys, personally I find weeknights at the guild to be best -- especially on rainy/foggy nights -- nobody is there... and the pics are excellent! I have some pics still to be processed from the last time I was there. I like to stop by on my way home from work -- seeing as I pass by it everyday on the way to and from work. A friend of mine and I tried going this past Sunday -- no go -- some huge art festival. We ended up doing the Dorthy McCarthy trail instead -- turned out to be better anyhow -- we got some amazing White tail deer images. I work evenings Mon-Fri so week-end suits me better, but if you guys prefer going during the week, go for it. Reunion! I'll email you guys. I love the Guild. I had the opportunity to get there one afternoon for an hour and it is so fantastic, I want to go back when again. please post when you are going. What a fantastic little gem that was!! Thanks for suggesting it lxdesign! I just spent the afternoon walking around the grounds and along the water too. I was in awe of all the artifacts, I didnt know how to go about shooting it because I was in such awe. Literally walking around with my mouth wide open lol Plus, there was not too many people either. A revisit is in the definite near future.